Home » List of all names mentioned in the diaries » More detailed information on some individuals » Medical colleagues » Matron Lavinia (‘Nina’) Eliza Caroline STEEN R.R.C. Lavinia Eliza Caroline STEEN was born in St. Petersburg, Russia, 20 January 1869, the daughter of a stockbroker. 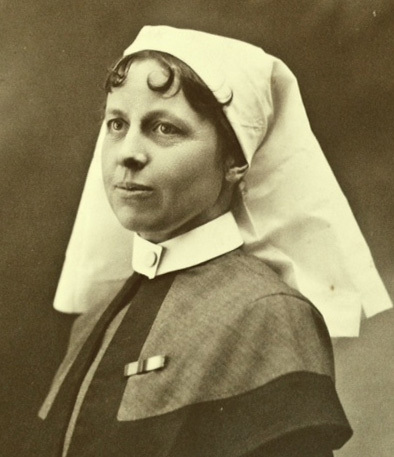 She trained as a nurse at Bristol General Hospital between 1891 and 1894, and was appointed to the Army Nursing Service in March 1897, transferring to Queen Alexandra’s Imperial Military Nursing Service in February 1903. She served in South Africa during the Boer war and was promoted to Matron in May 1910, the rank she held during the Great War. 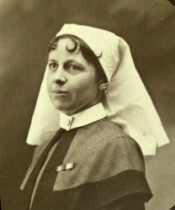 She was awarded the Royal Red Cross, First Class, in June 1916, and a Bar to the award in March 1919. 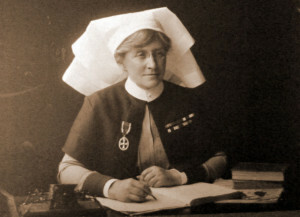 After being invalided home from France in March 1916 (this is mentioned in Edie’s dairy on 9 March 1916) she was granted sick leave, and later returned to work as the Matron of Reading War Hospital, Berkshire. She retired from the service on the grounds of ill-health in December 1922. She died in November 1942. We have now heard from Louise Ashby, a descendant of Matron Lavinia Steen, and she has sent this photograph. What a fine portrait it is. Louise Ashby (née Lucas) has very kindly sent further information below. The following is an extract from a letter to Molly Lucas (Louise’s mother) in Australia written on the 19th August, 1958 from Molly’s second cousin Francis Steen, living at the time in West Worthing, Sussex, England. Francis was a brother of Lavinia (Nina) Steen. Francis also served in the 1914-18 war. General Sir Francis Reginald Wingate, 1st Baronet GCB GCVO GBE KCMG DSO TD (25 June 1861 – 29 January 1953), usually known as Reginald Wingate, was a British general and administrator in Egypt and the Sudan. Sirdar – a variant of Sardar, a long-standing of Indo-Aryan rank – was assigned to the British Commander-in-Chief of the nineteenth century Egyptian Army.